A bit of news worth pulling out of our booth visit to href=”http://www.archos.com/” rel=”homepage” target=”_blank” title=”Archos”>ARCHOS has everything to do with Ice Cream Sandwich. The update is headed to their 10-inch G9 tablets, with a launch currently penned in for the first week of February. The upgrade from Android 3.2 to 4.0 will apply to the currently available generation of the tablet as well as the newly announced 1.5GHz dual-core CPU upgrade. 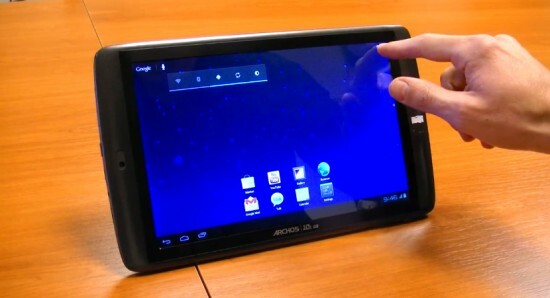 They didn’t beat href=”http://www.asus.com/” rel=”homepage” target=”_blank” title=”Asus”>Asus to the punch — the Transformer Prime received ICS earlier this week — but provided the update occurs smoothly and as expected, the G9 tablet will be among the first to run href=”http://google.com/” rel=”homepage” target=”_blank” title=”Google”>Google’s latest OS update.